It’s a temperate day in October and there’s a man standing in a pond, thigh deep in cold water. He’s a Dakota Access Pipeline security guard checking on equipment as protesters are being told to leave the north protester camp near Cannonball, North Dakota. The camp has just been shut down, and security is escorting protesters to the south camp on foot. It’s a volatile situation, and a scattered one. The guard, weapon in hand, flees to his vehicle when protesters chase him. Then, with police back-up more than a quarter mile up the road, he drives to the pond and walks in: an act of desperation, and one of fear. 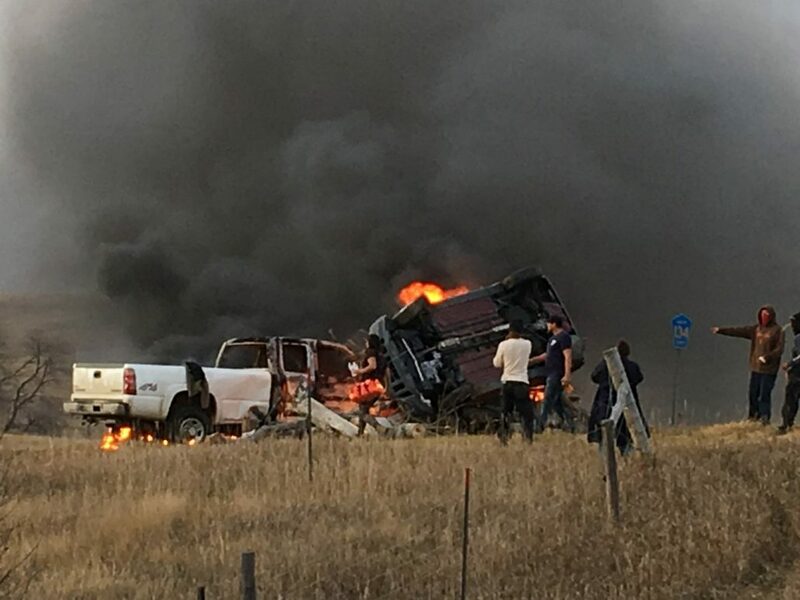 A handful of protes ters drive his truck to the top of a hill and set it on fire. Before long, they’ll push another car into the flames, and light the prairie on fire, too. The guard will stand in the cold pond for nearly an hour and a half, watching the sky turn black with smoke. Probably, he’ll never forget this day. Neither, turns out, will Sue Skalicky. Sue’s a journalism adviser at Legacy High School in Bismarck, North Dakota. She’s a journalist and a freelance writer and a mother of seven. She’s got a lot going on. So when she received an email from New York Times national desk editor, Mark Getzfred, she figured it was spam. But when she opened it and found a request for her services as a stringer at the DAPL protest, she got on the phone right away. Some paperwork, an ethics manual, and a last-period English class later, and Sue was on the road driving the forty miles to the protest, still wondering how the Times got her name in the first place. At the protest site Sue drove right up to the front lines. 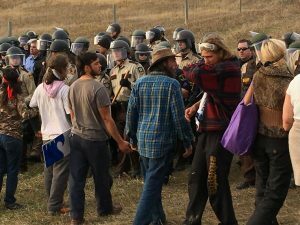 Two hundred officers in riot gear stood shoulder to shoulder across Highway 1806, pressing protesters away from the North Camp one step at a time. There were no press passes to be had, but no one stopped Sue, either. She blended in with the protesters. Men dressed in all black wore face masks and rode in the back of pickup trucks, a dozen at a time. They held homemade weapons and shields at the ready. People threw homemade bombs. It was one of the worst days of the protest to date. From her vantage point on the inside, Sue dashed off texts to a Times editor in Chicago, documenting everything she saw a couple hundred characters at a time. Sue’s never worked as a stringer before. She’s been a journalism adviser for 12 years. Before that, she worked as a Features writer for a Wyoming weekly. Reporting from the DAPL protest was unlike anything she’d ever done. “What they hired me for mostly was observation. And so that’s the role I played,” Sue says. 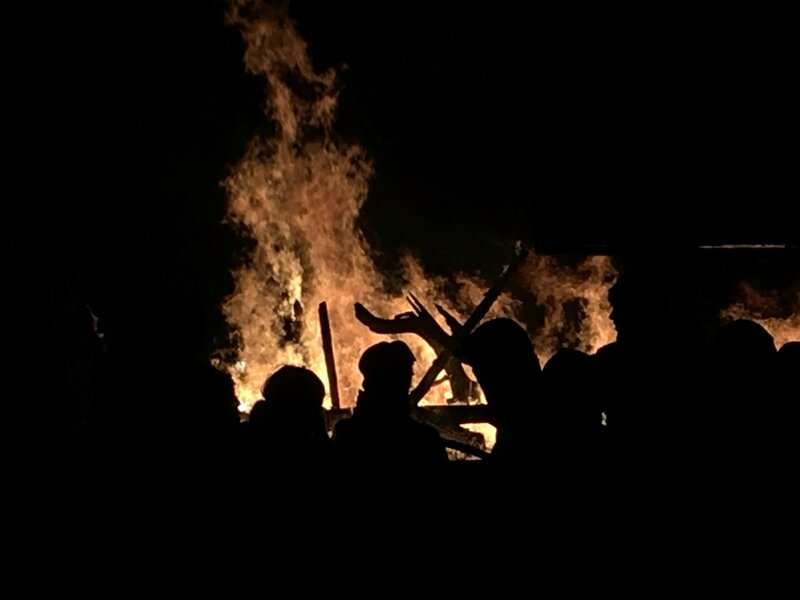 The stand-off goes on past dark, with protestors building fires of scrap wood and any other available materials. 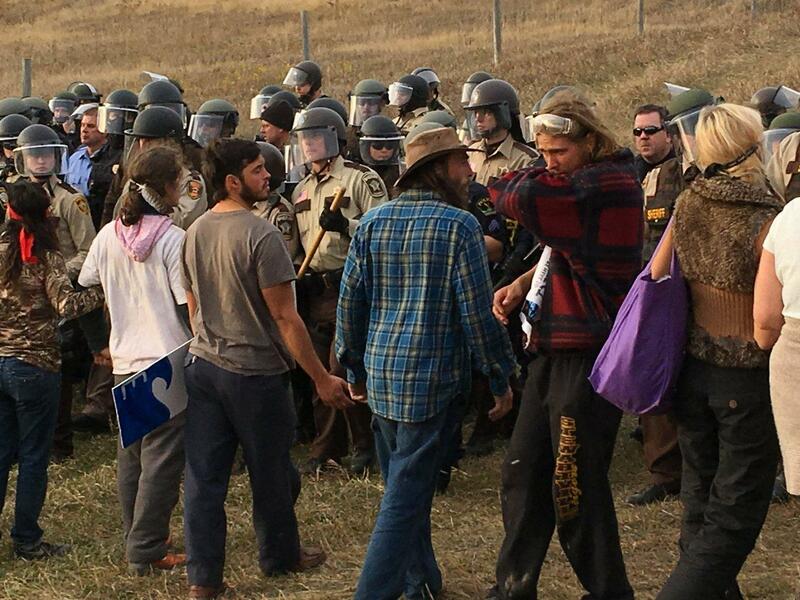 Officers and protestors face off as the north protester camp is shut down near Cannonball, ND. Sue stayed at the protest for seven hours, in constant contact with the editors in Chicago. The next morning, before class, Sue and the Chicago editor co-wrote the story over the phone. It was posted online in just hours and came out in print the next day. These days, Sue’s back to her normal life. She’s grateful for the experience and it’s one she’ll never forget. She’s not worried about it going to her head, either; the editor at the Times made it clear that he hires stringers all the time and often never works with them again. He also told her that stringers rarely get a byline. But Sue? She got a byline. So there’s that.